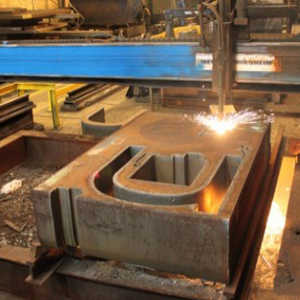 Flame cutting / Steel Profiling exploits the fact that ferrous metals combust in oxygen at a temperature of around 850 Centigrade. A torch with a nozzle attached is used for this process. The torch combines a supply of oxygen and fuel gas (commonly propane) and passes this through the nozzle to provide a controllable flame which is applied to the surface of the plate to be cut. When the combustion temperature is reached a controlled stream of oxygen at pressure is introduced through the nozzle into the centre of the flame. The oxygen causes the steel to combust in a controlled and confined area; the pressure of the oxygen pushes the combustion process through the thickness of the steel and expels the resulting slag underneath. The torch is mounted on a machine that moves smoothly on two axis’s under CNC control, capable of producing complex shapes accurately and with a good quality cut edge.